The death of Tataka and Rama’s subsequent battles with her sons Mareecha and Suvahu are the themes of Ramayana panels No.8 and 9 at Kumbakonam and No.11 & 12 at Pullamangai. 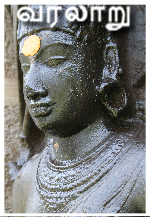 The death of Tataka is one of the unique themes of the Kumbakonam Ramayana narrative, not portrayed in any other Chola temple. The overall scope of Kumbakonam narrative was to portray the entire story of Rama right from his birth until the conquest of Lanka and killing of Ravana. Hence only the most significant themes and events from the story were chosen for portal, while several other auxiliary themes and details were omitted. Given this context, the portrayal and scope of Tataka’s final moments in such significance acquires greater importance and underlines the importance artisans attached to this event. The panel is dominated by Tataka who has fallen to the ground. Her overall posture and hand gestures reflect a strong sense of rejection and disappointment. Clearly, she is rejecting the act of Rama with despondence and melancholy. Her face is turned away from him as much as possible. Her Vismaya mudra on the left hand conveys her wonderment and rejection at Rama who chose to hit her with an arrow in spite of knowing that she is a female and a lone warrior. With such a portrayal of Tataka, the sculptor is seriously questioning the correctness behind the act of Rama in killing a female. The rest of the panel portrays Sage Viswamitra, who is explaining the background of Tataka with raised right hand to Rama – standing next to him and watching the death without much expression. Lakshmana is standing next to Rama. In literatures, Rama’s hesitation in attacking a female is highlighted, but there is a significant departure in Kamban in this aspect as compared to Valmiki. In Valmiki, Rama’s original doubts are quickly dispelled by Sage Viswamitra who explains in detail the troubles brought about by Tataka in the forest domains. It is clear that in the cultural context of Valmiki, killing a female is not such a heinous crime as long as she belongs to the Asura class. In Kambar, Rama is not convinced about the killing at all, in spite of many explanations from Viswamitra – clearly indicating that the poet himself was not fully convinced. This is truly a reflection of values that prevailed of Chola times, which held woman in high esteem and honor. In order to safeguard Rama and protect his heroic status, the poet puts some very intelligent words in the mouth of Rama who is addressing Viswamitra: “I am doing it simply because you told me to do so!” [Tatakai Vadai Padalam, 45]. செய்கை அன்றோ! அறம் செயும் ஆறு என்றான். In other words, the Rama of Kambar is totally disassociating himself from the correctness of his own act and is killing Tataka simply to honor the orders of the learned Sage. Prof. A.S. Gnanasambandan reflects upon this ethical and moral dilemma in the mind of Rama in detail in his monumental work on Kamban [Gnanasambandan, 1993:192]. Views of Kambar are beneficial in understanding the sentiments expressed by the sculptor in this panel. By representing the viewpoint of Tataka, he elevates this theme to the level of Vali’s death – which is a much more definitive slip of high moral and ethical standards that Rama personified. Unfortunately, the panel at Pullamangai located next to the attack of Tataka is severely damaged and is worn out. It is difficult to recognize the figures and the theme it portrays. So it is not possible to ascertain whether it represented the death of Tataka or something else. Following the death of Tataka, her sons Mareecha and Suvahu come to attack Rama. This event is briefly captured in one panel at Kumbakonam – but is subjected to a much more elaborate portrayal at Pullamangai. On the right side of the spectator, one of the Asuras is running towards Rama to attack him. His Jatabara headdress and the wooden mace like weapon are worth noticing. In the middle, another Asura is already attacking Rama. To the other side of the Panel, Rama is seen defending the attacks with his valiant bow and arrow. One of the attacking Asuras soon loses his battle and falls in Rama’s feet – as represented by the prostrating figure down below. This Asura is one of the two attacking Rama just above. The other is not represented because he is thrown far away into the Ocean by Rama’s arrow. Multiple postures and animations of Asuras on one side are balanced by the rock solid figure of Rama on the other side, fighting the battle unabated. 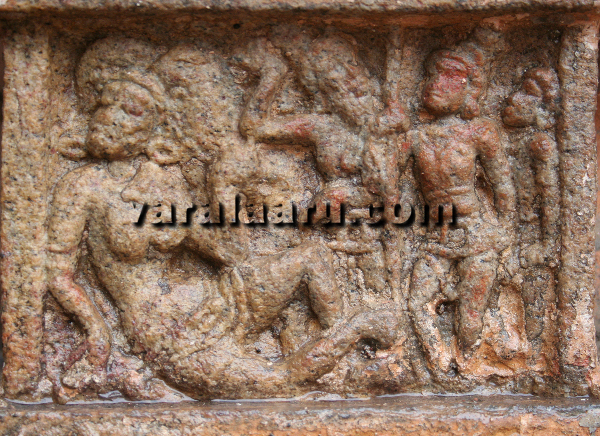 The attack of Mareecha, Suvahu and his Asura friends on Rama and the ensuing battle is the theme of two elaborately sculpted panels at Pullamangai. It is interesting to note that such a significant treatment of this event is not available in any other early Chola Ramayana narratives. Throughout the Pullamangai narrative, it can be noticed that the artisans have portrayed the battle scenes of Ramayana in great detail. Pullamangai contains the maximum number of combat positions of Rama – as compared to other Chola Ramayana narratives. There is little doubt that one of the central themes resonating throughout Pullamangai is that of Sangrama Raghava or “the warrior Rama”. The meticulous treatment of Mareecha-Suvahu episode should be viewed in this broader context and theme of Pullamangai narrative. In the first panel (No.12), the Yagna has already begun on one side. Suvahu and Mareecha (represented here as a Deer, as a prelude to the forthcoming episode) are beginning to attack Rama from the skies. Rama is shooting arrows at them in Aleeda posture. Lakshmana is standing nearby. The panel is dominated by the figure of Rama. It is noteworthy that this is the third representation of Rama with bow and arrow and all three are Aleeda. The direction of his bow clearly indicates that his opponents are in the sky. It is worthwhile to compare this confident posture of Rama with that of an earlier panel (No.8 – Vasishta trains Rama). Even though both are Aleeda postures and both represent the front view of Rama, the variations are striking. It is amply clear that by the time Rama goes in defense of Viswamitra’s sacrifice, he was already a full scale warrior. This panel at Pullamangai is very unique and peculiar in multiple aspects. It is also one of the themes not dealt with in any of the available literatures on Ramayana. 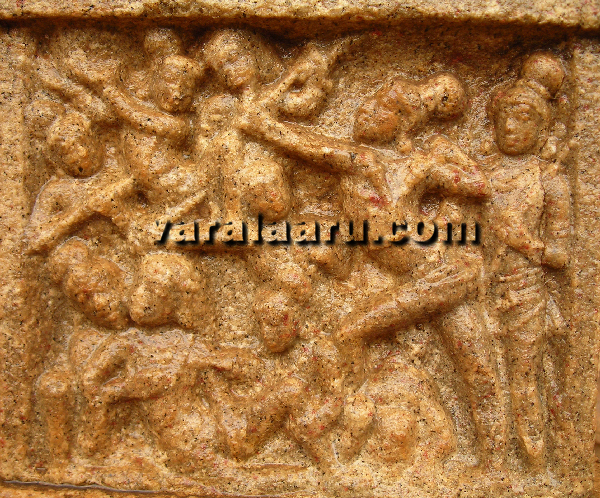 It shows that the attack of Mareecha and Suvahu is followed by a much more furious attack by a band of Asuras – all probably belonging to their army. The battle is so violent that Rama is eventually injured and falls – before driving the Asuras out of the premises. This is the very first panel at Pullamangai representing Rama in Prathyaleeda for the first time. It is the fourth combat position of Rama here – and this time the artisans choose to look at Rama from the left, an angle not seen as yet. Also, it is the very first time that Rama is seen with a significantly sculpted Sanna Veera – an ornament peculiar to the warriors. It should be remembered that this ornament is is often worn by Lord Muruga and Goddess Kotravai – two favorite deities of the warrior class. The panel is once again dominated by fighting Rama, whose vigorous posture is fully captured by the various bends in the body. He is continuing to fight the enemies from the skies. His left arm is fully extended and the full thrust of his body is represented by his forward movement. It is clear that the battle has become much more serious and definitive. To the right of the Panel, a series of Asuras are fighting Rama. This time, they are carrying a wide variety of weapons – including large rocks. The attack is vigorous and all of them are fighting from the Sky. In the bottom portion, we see a figure fallen down - exhausted and probably injured. That this figure is Rama is borne out by the fact that he is leaning on the shoulder of a Sage, none other than Viswamitra. His brother Lakshmana is holding one of his legs in great concern. The Sage is touching his chest and probably applying some medicine or comforting him. In Valmiki, Rama is a warrior of class – but he is susceptible to injury and attacks. The treatment at Pullamangai resonates with a similar idea. The artisans probably wanted to highlight the fact that even the best warriors are susceptible to attacks and injuries in a battleground. In Kumbakonam, the death of Tataka is a very significant event which occupies one full panel. The artisans are not content just with the portrayal of confrontation between Tataka and Rama; they wanted to show the final moments of Tataka and her striking denial [Igazhchi in Tamil] of Rama’s valor. Such botherations are not met with at Pullamangai. On the other hand, Pullamangai artisans take up the battle between Mareecha-Suvahu and Rama and expand it into an elaborate theme –eventually resulting in a serious injury for Rama. Highlighting the warrior aspect of Rama is one of the high points of Pullamangai narrative.